FAO Fisheries and Aquaculture Department - Life cycle assessment of southern pink shrimp products from Senegal. An environmental comparison between artisanal fisheries in the Casamance region and a trawl fishery based in Dakar. 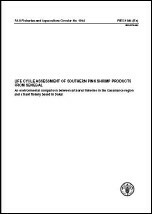 Life cycle assessment of southern pink shrimp products from Senegal. An environmental comparison between artisanal fisheries in the Casamance region and a trawl fishery based in Dakar. PREPARATION OF THIS DOCUMENT This FAO Fisheries Circular is based on a study carried out as a collaboration between the Fisheries and Aquaculture Department at the Food and Agriculture Organization of the United Nations (FAO), the Swedish Board of Fisheries, the Swedish Institute for Food and Biotechnology (SIK), Intervenir pour le développement écologique de l'environnement en Casamance (IDEE Casamance) and Centre de recherches océanographiques de Dakar-Thiaroye (CRODT). The main aim of the study was to quantify the environmental impacts caused by a Senegalese shrimp product from fishing to market by performing a life cycle assessment (LCA) of the artisanal fishery for southern pink shrimp in the Casamance region. Secondary aims were to compare the different fishing methods (artisanal and industrial) from an environmental point of view. This circular was prepared by Ms Friederike Ziegler (Swedish Institute for Food and Biotechnology), Mr John Lucas Eichelsheim (IDEE Casamance), Mr Andreas Emanuelsson (Swedish Institute for Food and Biotechnology), Ms Anna Flysjö (Swedish Institute for Food and Biotechnology), Mr Vaque Ndiaye (Centre de recherches océanographiques de Dakar-Thiaroye) and Mr Mikkel Thrane (Aalborg University). Support for the study has been provided through the Swedish International Development Cooperation Agency (Sida)-funded FAO FishCode TECPRO Project and the Swedish Board of Fisheries. Ziegler, F.; Eichelsheim, J.L. ; Emanuelsson, A.; Flysjö, A.; Ndiaye, V.; Thrane, M.
Life cycle assessment of southern pink shrimp products from Senegal. An environmental comparison between artisanal fisheries in the Casamance region and a trawl fishery based in Dakar. FAO Fisheries and Aquaculture Circular. No. 1044. Rome, FAO. 2009 29p. ABSTRACT Life cycle assessment (LCA) of two Senegalese seafood products exported to Europe has been undertaken based on the functional unit of one kilogram of product (frozen whole shrimps, independent of size) plus the accompanying packaging at the point of import to Europe, i.e. transported by boat to Vigo, Spain. The products are exchangeable on the European market, but the way they reach this market from the fishery over processing is very different. One product is produced through on-board processing on demersal trawlers based in Dakar fishing at sea in FAO fishing zone 34 (eastern central Atlantic), then landed and stored before being exported to Europe. The other product originates in artisanal fisheries in the Casamance River in southern Senegal. Fishing takes place to similar extents by the two fishing methods: Mujas, a fixed trawl set in the deepest part of the river from a canoe, and Félé-félé, a type of driftnet managed by three men in a canoe. The shrimps are landed and transported to a processing plant in Ziguinchor where they are washed, packed and frozen before land transportation to Dakar, storage and finally shipment to Europe. The three fisheries included (trawl, Mujas and Félé-félé) were shown to have highly different catch compositions. Each fishing method has advantages and drawbacks from a biological point of view, i.e. proportion of discard, landed bycatch and small shrimps in the catch. LCA results showed major differences between the two final products, with regard to resource use and environmental impact, depending on their origin. For the product originating in trawling, fishing was the most important activity in all categories of environmental impact. For the product originating in the artisanal fishery, fishing was the most important activity from a biological point of view. In contrast, processing and storage dominated the two categories: global warming and ozone depletion potential. The main areas to improve regarding these categories in the production chain of the trawled product are the use of fuel and refrigerants on board, while the main areas for improvement in the chain of the artisanal product are the use of energy and refrigerants in the processing plant and the energy source used by the plant. Both on board the trawlers and in the mainland processing of artisanal shrimps, considerable amounts of refrigerants with a high global warming and ozone depletion potential are used to freeze the shrimp products. In both chains, transportation was found to be of minor importance. Increased traceability and labelling is also desirable to enable active consumer choices between products.